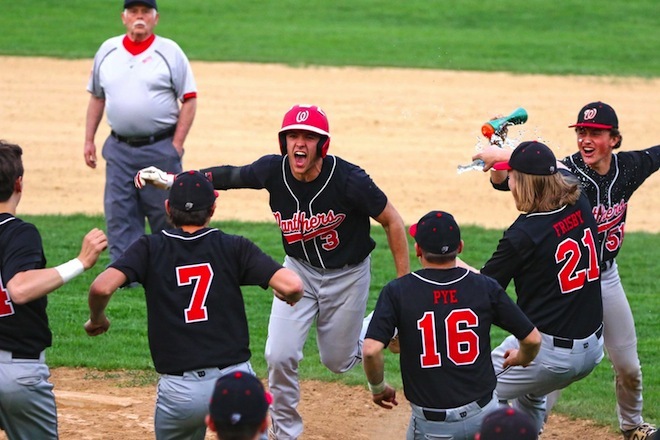 Gunner Peterson celebrates with his teammates after he knocked in the winning run against Westosha Central Tuesday (Earlene Frederick/The Report). Wilmot Union High School’s Gunner Peterson acknowledged Tuesday’s Southern Lakes Conference contest with Westosha Central had plenty on the line. The fourth-ranked Panthers, according to the May 6 Wisconsin Baseball Coaches Association poll, entered the clash against their county rivals clinging to a half-game lead in the SLC. The clash, however, needed eight innings to complete after the teams came into a 5-5 stalemate after regulation. With one out in the bottom of the eighth inning and Zach Lamberson on second base, the Falcons walked Tanner Peterson to face his brother Gunner and create a double play. Gunner Peterson, however, hit a line drive to centerfield, sending Lamberson home for the 6-5 victory. “It feels really good to beat our rival, I knew it was a big game coming in,” said Gunner Peterson, who went 1 for 4 with a run scored. The Panthers (13-3, 8-2 SLC) victory comes in spite of a disastrous top of the third inning, where they misplayed a handful of fly balls in the outfield, which led to five Falcons runs. Panthers coach Josh Pye, whose team trailed 5-1 entering the bottom of the third inning, told his team to chip away at the deficit. From there, the Panthers responded with a two-run bottom of the third inning, and added a run in the fourth and sixth innings. “We just aren’t making the plays on defense right now and giving teams extra outs,” said Falcons coach Jacob Morman. Wilmot posted its first run in the first inning, where Leo Falletti, who hit a leadoff single, scored on a hit by Justin Paasch. Westosha Central, down 1-0 with one out in the third inning, capitalized on misplayed fly balls. Austin Glidden hit a double to a score Myles Kazumura, who also doubled, to deadlock the contest 1-1. Westosha Central then scored the go-ahead run, courtesy of an Andrew Hrncar hit, which plated Glidden. Two hitters later, following a Josh Leslie single and Cooper Griffiths walk, the Falcons extended their lead to 4-1 on a Sam LeFebve two-run single to score Hrncar and Leslie. Kyle Mitchell drove in Griffiths to post the final run of the inning. LeFebve batted 2 for 3 while Leslie was 2 for 4 to lead the Falcons. In the next inning, Wilmot cut the Falcons lead to 5-3, thanks to a Kyle Gendron two-run double to score Gunner Peterson, who advanced on a fielder’s choice, and Paasch. Paasch singled. “When Gendron hit that ball into left field and scored those two runs, he got us back in the ballgame,” Pye said. Gunner Peterson agreed, adding the hit uplifted his team’s spirits. “He gave us a lot of our energy and a confidence boost,” Gunner Peterson said. Tanner Peterson, in the bottom of the fourth inning, cut the Panthers’ deficit to one run on double to score Falletti, who walked. Two innings later, Paasch tied the game on a sacrifice fly, which plated Falletti, who walked. Tanner Peterson, the Panthers starting pitcher, was pulled from the mound after the sixth inning as he neared the maximum 100 pitches. Aside from a five run third inning, Tanner Peterson struck out five, walked two and allowed nine hits through six innings. “Tanner did a great job of continuing to compete against some tough hitters in the third and once we were out of it, he was able to keep us in a ball game and give us a chance to win,” Pye said. Jacob Gerzel, in relief of Tanner Peterson, tossed two scoreless frames to send the contest into the eighth inning. Lamberson, who led off with a single, advanced to second base on a Griffiths wild pitch. Griffiths then struck out Falletti to send Tanner Peterson to the plate. With first base open, and Tanner Peterson leading the Panthers at two hits, he received a free pass. Falcons coach Jacob Morman, hoping to turn a double play, took a chance with Gunner Peterson. “We didn’t want Tanner to beat us, we took our chances, with hopes of turning a double play,” he said. Gunner Peterson, however, squandered Morman’s plans with the game-winning hit. Pye, noting the Panthers’ potent offense, had confidence in Gunner Peterson. Gerzel picked up the win, holding the Falcons hitless in two innings, where he struck out four and walked two. Griffiths, meanwhile, took the loss in relief of starter Glidden, who was at 99 pitches after 4 2/3 innings. Griffiths walked two, struck out two and allowed an earned run on three hits in 2 2/3 innings. The Falcons (9-5, 5-5 SLC) looks to avenge the loss Thursday when the Panthers pay a visit to Westosha Central. Editor’s note: An earlier version of this story incorrectly identified Kyle Mitchell as Keith. This version has been updated. The Report regrets the error.